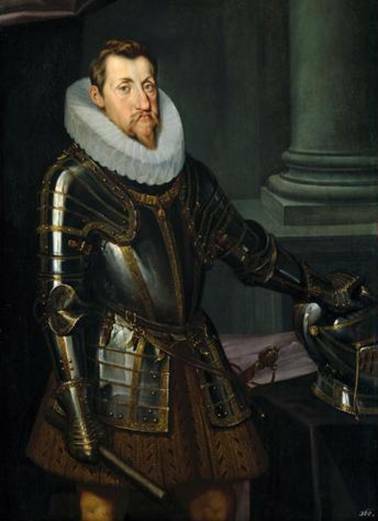 Ferdinand II was born on 9 July 1578 in Graz as a son of Charles II, Archduke of Austria and Maria of Bavaria. He was a member of the House of Habsburg, Holy Roman Emperor, King of Bohemia and the King of Hungary. In 1590, his parents, who were devout Catholics, sent him to study at the Jesuits´college in Ingolstadt because they wanted to isolate him from the Lutheran nobles. Ferdinand was installed as the actual ruler of the Inner Austrian provinces in 1596 and 1597. Rudolph II also charged him with the command of the defense of Croatia, Slavonia and southeastern Hungary against the Ottomans. Ferdinand became a King of Hungary in 1618 and he died on 15 February 1637.